A very nice breeze produces renewable energy from wind power. The wings pitch is variable and by control based on various input data, the wings are pitched proportional to wind conditions as determined by the control system. 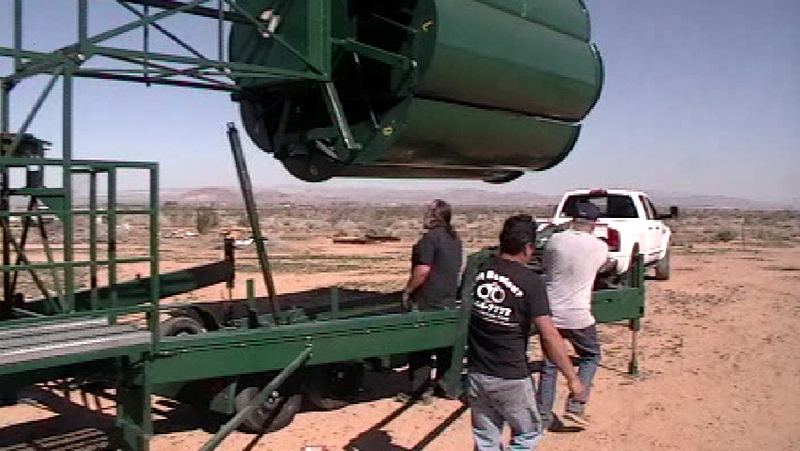 This VAWT invention is an assembly of several wings on a rotary apparatus with simultaneous pitch control. This pitch control maximizes the power transmission from the air flow around and through it. The pitch is proportional to the wind speed, air temperature and humidity, density and rotational speed. When the pitch control closes the wings, the leading edge of each wing is overlapped by the previous wing to produce a cylindrical apparatus able to avoid extremely high winds. It can quickly furl to protect it in extremely high winds and can operate in any wind, 5 MPH through 80 MPH. The power generation device is at ground level. 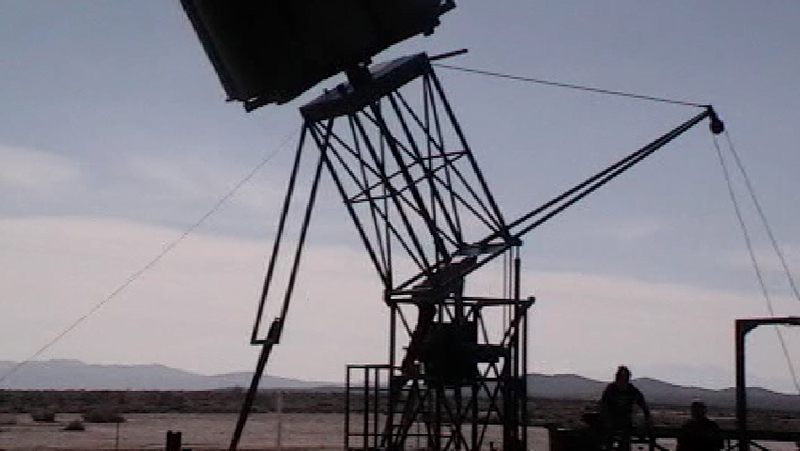 A vertical drive shaft drives the power generator. It doesn’t require erection equipment. The electrical energy produced by the wind driven alternator is also controlled by this system. My invention is superior to all other designs of this type equipment with low cost, nearly no maintenance and high efficiency. It makes little noise and does not kill birds. 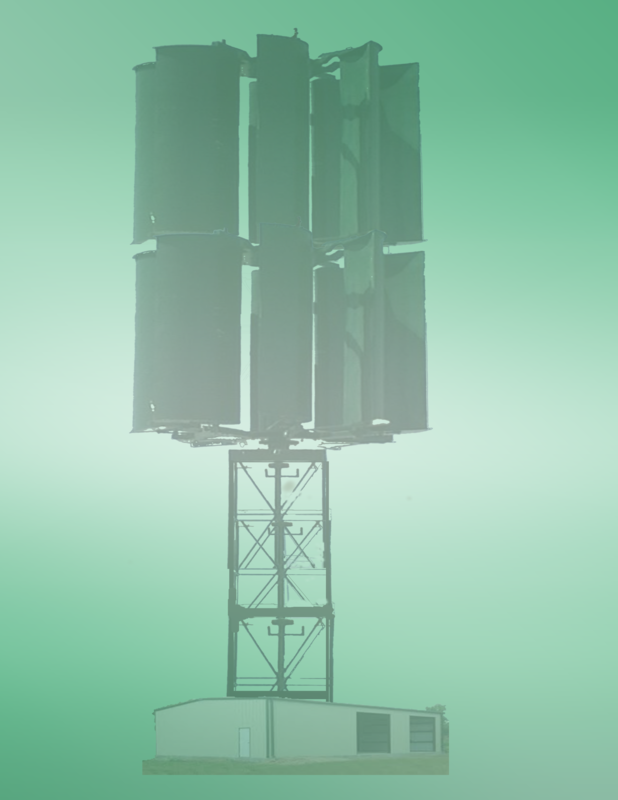 The energy collector may be mounted on a tower of any height according to topography and environmental conditions. Below is a list of documents and information about our company and plans for our future and yours! Right click and choose “save link as” or click on link to view in browser. 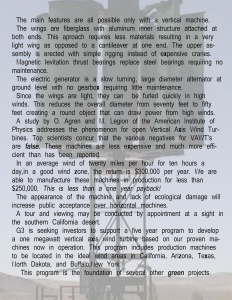 By making this comparison, the features of the G3 (VAWT) turbine shall be identified and described.First, a general description of the VAWT.The VAWT spins on a vertical axle with spokes at the top and bottom of the turbine. Wings very similar to aircraft wings are attached between these spokes and pivot controlled by a furling apparatus. 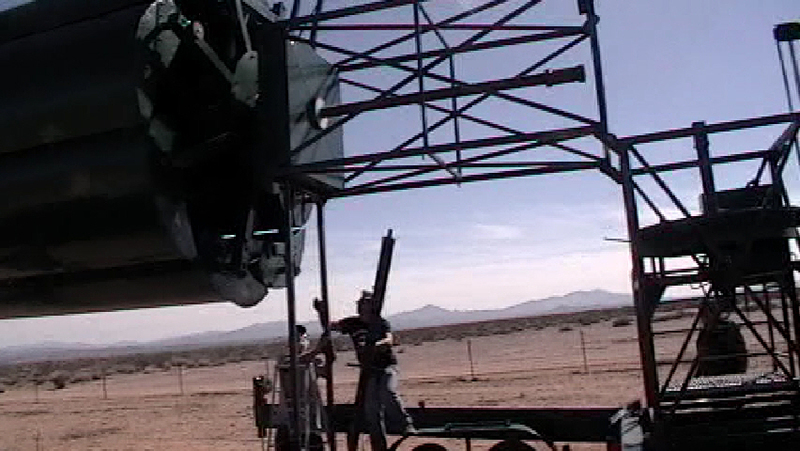 The relatively light turbine assembly is mounted on a tower. At the base of the tower, ground level, is the alternator. Furling refers to storing or securing sails or flags out of the wind. For turbines, it is the function of shutting down and turning to reduce damaging forces of high winds. HAWTs furl by braking and stopping the turbine, rotating the blades to neutral and rotating the complete head, blades and power house broadside to the wind. The top of a HAWT is very heavy and does not rotate rapidly. Twenty three(23) of twenty five(25) San Diego Gas and Electric turbines, fifty (50) miles east of San Diego were damaged by a seventy (70) mile per hour wind gust that they could not furl fast enough to avoid. Wrong. The G3 VAWT can pivot the wings which overlap each other to producing a reduced diameter round object. Since each wing is light, it pivots rapidly and is able to furl in a very short time. Since the G3 VAWT is able to close up in high winds, it is not necessary to close completely allowing it to produce power in high winds. 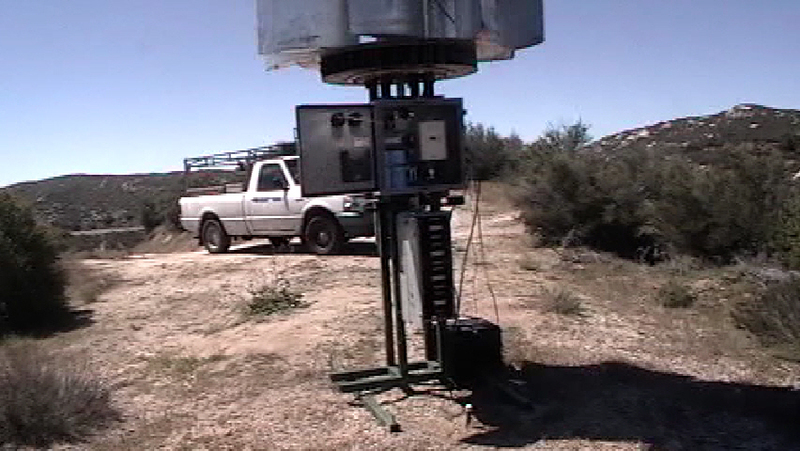 A control, monitors the wind conditions and adjusts the wings accordingly, regardless of wind intensity. As long as the G3 VAWT is built to withstand high winds, there is no reason not to draw power from it. But HAWTs shut down at twenty-eight (MPH) miles per hour. The G3 VAWT never shuts down. Myth-VAWT: Are structurally weak. -Wrong. HAWT have very long cantilever blades attached on one end. VAWT blades or wings are attached at both ends requiring less structure, less weight for comparable structural integrity. The rotation speed causing centrifugal force on the wings is not difficult to design for, since the rotational speed is not great, especially for large turbines. 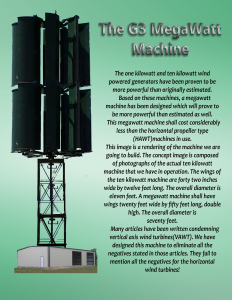 The megawatt turbine is expected to have a sixty (60) foot diameter. According to our research, a floating turbine, that is; a turbine producing no power consequently, no load, rotates with a peripheral speed about 25% greater that the wind speed.The sixty (60) foot diameter turbine has a 188.5 foot circumference. In a 100 mile per hour wind, the rotor would turn at fifty eight(58) RPM. Under load, producing power, the rotational speed would be thirty(30) RPM. Myth-VAWTs are inherently inefficient since during rotation, half the blades are traveling with the wind and half the blades are traveling against the wind. First, the statement is true, but is not a negative, in fact it is an advantage. As any sailor or aviator would recognize, the blade or wing angular to the wind produces lift and in this case, drive. 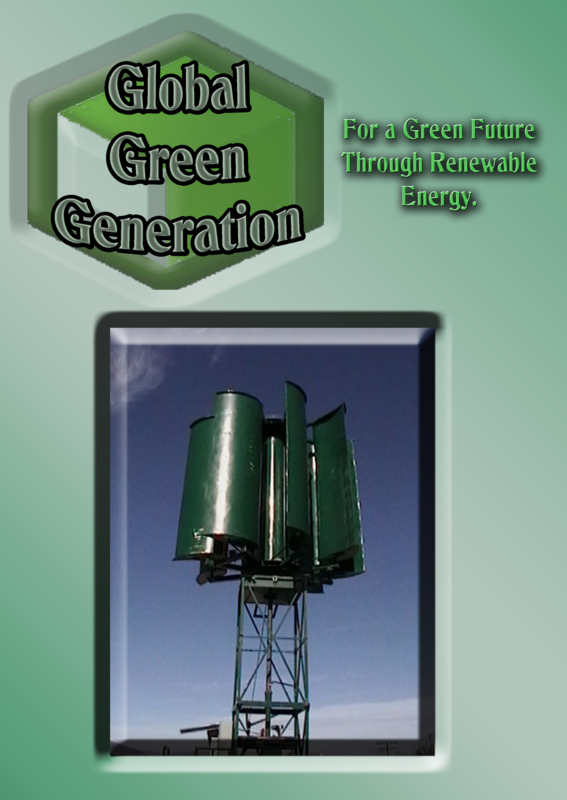 The side rotating with the wind produces less power. HAWTs actually require input power to start the rotors turning in order to produce the lift in conjunction with the wind to produce power. A study by O. Agren and M. Legion of the American Institute of Physics addresses this phenomenon for open VAWTs. 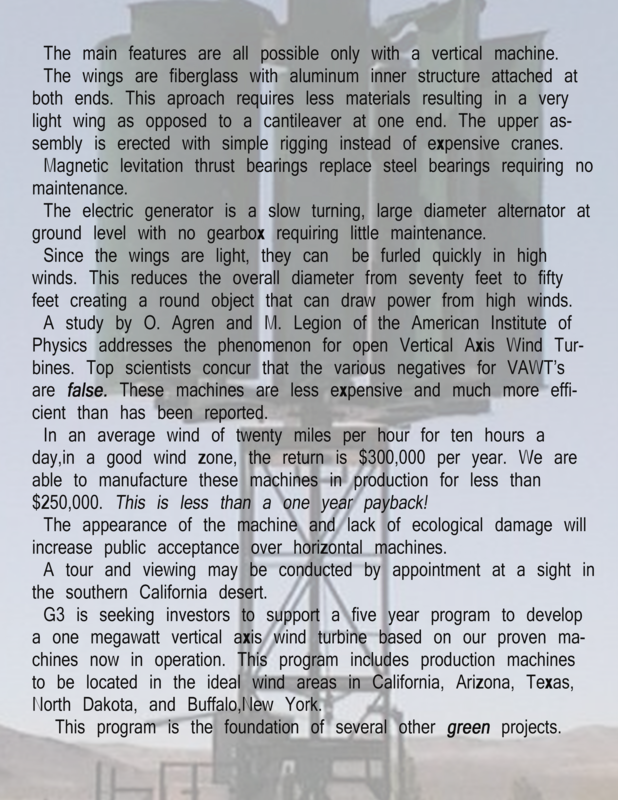 The G3 VAWT is closed resulting in low speed high torque like a Savonius turbine and high speed efficiency of a Darreius turbine making this design omni-directional and self starting requiring no external power to operate. Second, the truth: HAWTs are not omni-directional as VAWTs are. The blades, rotor and power house must rotate to face the wind to operate. 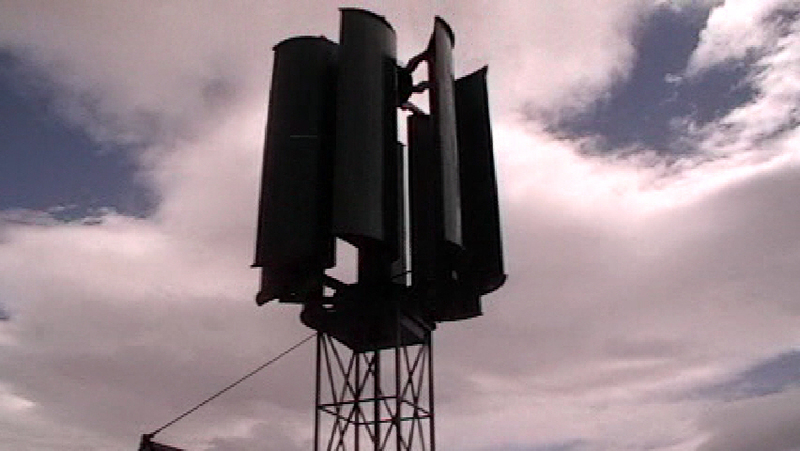 HAWTs produce a vortex in the wind causing buffeting and turbulence following the turbine. The flow through a VAWT is laminar, slightly pulsed and quickly smoothed with no vortex. HAWTs kill birds. The blade tips for a one hundred fifty(150) foot blade at only fifteen(15) RPM travel at one hundred sixty (160) miles per hour and rotate perpendicular to the flow of the wind, which is typically the direction of bird flight. Birds traveling twenty (20) miles per hour are seldom broadsided by a blade. At the blade tip is created an invisible vortex wind of 170 to 200 MPH which damages the birds respiratory system and the bird suffers a horrible death of pain and asphyxiation. This vortex is the sound of the turbine. G3 VAWTs are closed and very visible and rotating about an axle with a peripheral speed slightly faster than the wind. G3 VAWTs do not kill birds. 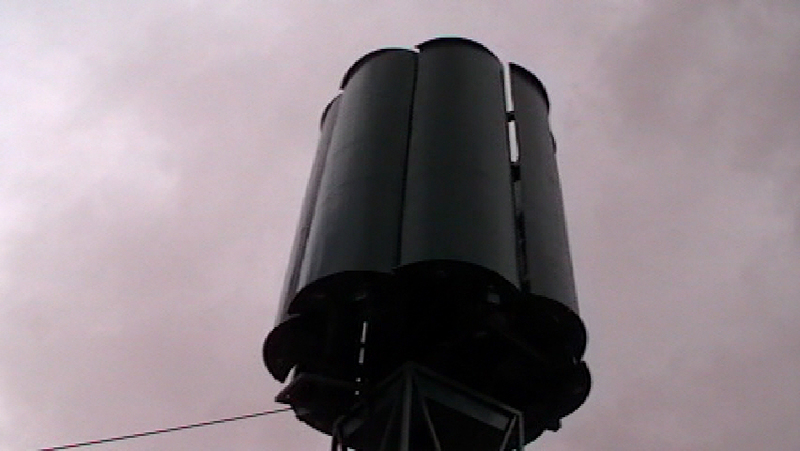 In fact, swallows have nested and raised a family in the cooling blower of our prototype. G3 VAWTs are light at the top allowing assembly on the ground and erection with self contained rigging. 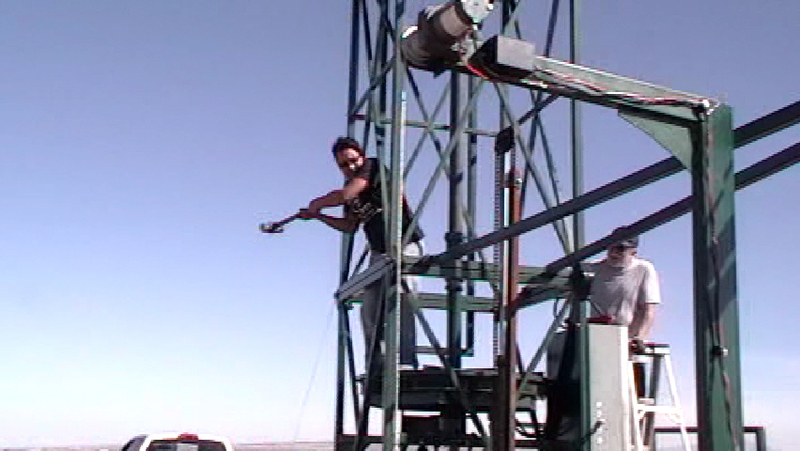 HAWTs require huge cranes and expensive equipment to construct and service the machine. HAWTs rotors are mounted on lubricated steel bearings driving alternators through gear boxes all located hundreds of feet above ground. The G3 VAWT will evolve to magnetic levitation, no bearings. No Maintenance. The G3 VAWT transmits power through a vertical drive shaft to a large diameter alternator at ground level without a gear box. No Maintenance. Third- Other features and developments. We have developed a power regulator controller applicable to any size turbine. We have developed a modular alternator allowing for manufacturing of three sizes of modules that can be used on any size turbines of 1 KW through 10KW, 10KW through 100KW and 100KW through 1MW, in conjunction with our regulator to produce power AC or DC. 24 Volt to 4160 Volt, all without a speed increasing gear box. 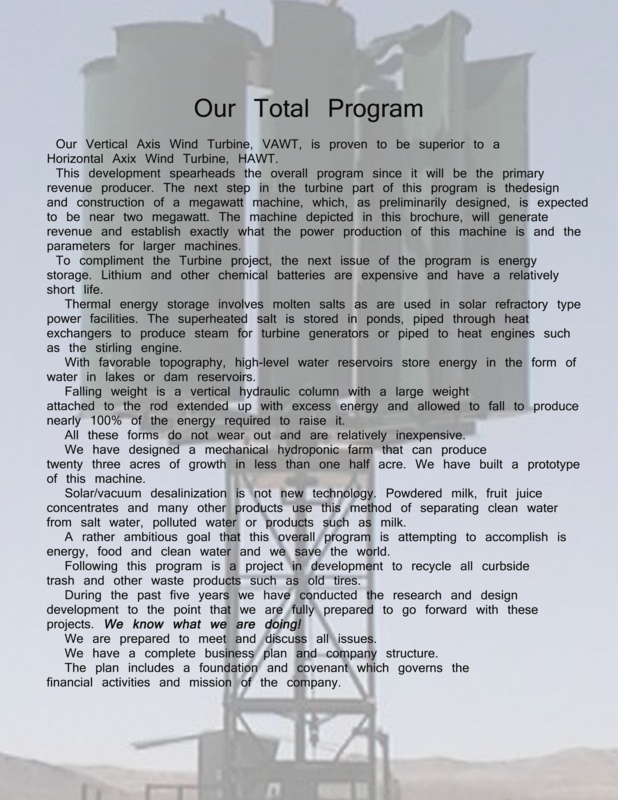 Vertical Axis Wind Turbine,VAWT,How it’s done. 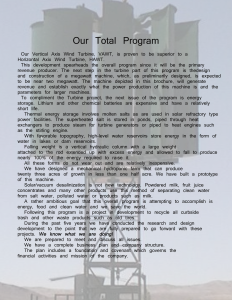 A brief description of the design and construction of a Vertical Axis Wind Turbine. 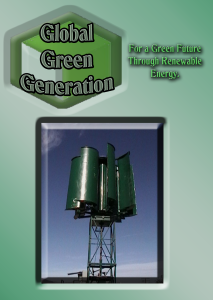 Built by Process Automation for Global Green Generation as an ongoing effort to better our planet! 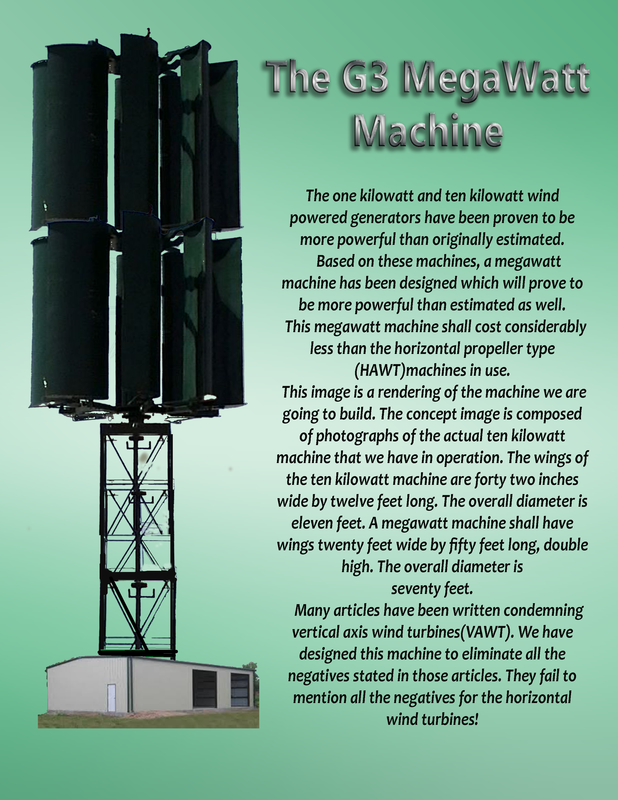 The invention is a vertical axis MAEC with variable pitch wings in place of blades. The operational principles are based on Bernoulli’s principles, not Savonius or Darrieus. The wings pitch is variable and by control based on various input data, the wings are pitched proportional to wind conditions as determined by the control system. This invention is an assembly of several wings on a rotary apparatus with simultaneous pitch control. This pitch control maximizes the power transmission from the air flow around and through it. The pitch is proportional to the wind speed, air temperature and humidity, density and rotational speed. When the pitch control closes the wings, the leading edge of each wing is overlapped by the previous wing to produce a cylindrical apparatus able to avoid extremely high winds. It can quickly furl to protect it in extremely high winds and can operate in any wind, 5 MPH through 80 MPH. 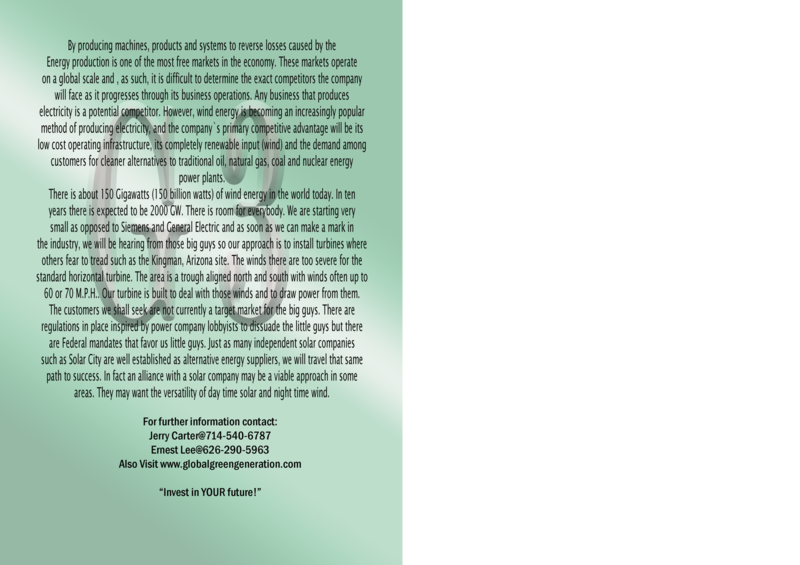 We already know that the use of electricity, gas and coal are all resources that we may eventually run out of. These are the non-renewable resources that we rely heavily on today. We use these non-renewable resources to do many things, including supplying us with power, heating our homes, businesses and schools and more. When we use all the non-renewable resources up and there are no more to gather, then what? How will we go without the convenience that we are so accustomed to? It’s nice to flip a switch to get power and it is even better when the latest technology allows us to press a button to do all the things that women and men had to work for hours to accomplish. We are fortunate to live in a world with so many modern gadgets. Unfortunately when we lose it we may be so accustomed to the modern perks that we will not know what to do when we don’t have them any longer. The answer must be renewable energy. What we have to rely on in the future is renewable energy. 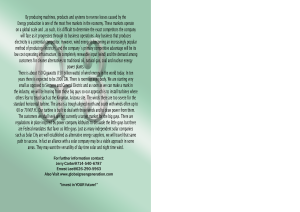 These resources are all resources that offer us an abundant supply and will never run out. They recharge and allow us to enjoy them again and again. Renewable energy consist of Solar, Wind, Biomass, Hydrogen, Geothermal, Ocean, and Hydropower We need all of these and right now we have access to each one of them. 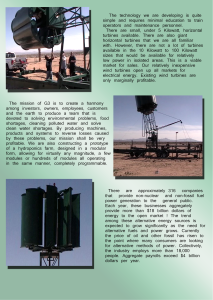 What do they do and how do they help us with solar power? Let’s find out. Solar power,a renewable energy, refers to the solar energy that we get everyday either directly or indirectly from the sun. Solar energy can be used for several things, such as heating, electricity to home, schools, businesses, or buildings, heating water, cooling and ventilation. Wind helps the suns heat down to earth. When the wind combines with the heat of the sun, it causes evaporation. When the water turns into precipitation it produces energy that can then be captured by hydropower. Hydropower, also a renewable energy, takes energy from flowing water and captures it turning it into electricity. 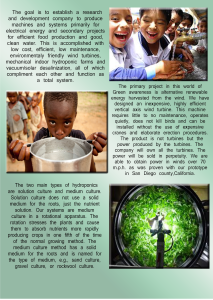 Hydropower is very complicated and requires a great deal of technology in order to successfully accumulate energy from water. Biomass is an organic matter that can help to make up the plants. It can be used for the production of electricity, transport fuels or chemicals. Hydrogen is the most abundant element found on earth, usually with other elements. If hydrogen is found alone it can be burned or converted into electricity. Geothermal looks toward the inner parts of the earth for heat and can be used for power, heating, and cooling. Ocean produces thermal energy using the heat from the sun. It can also use mechanical energy for the tides and waves. Renewable energy resources are all around us. We know what they do and how we can use them. There are so many benefits to using renewable resources. If we don’t use them now we may not have a choice later. The knowledge we learn from today will help us use renewable energy more wisely.